The search for a perfect cushion that works wonders on my oily skin is somewhat a never ending journey. Most cushions have glowy and sheer finish whereas I prefer something with matte finish and medium to full coverage. 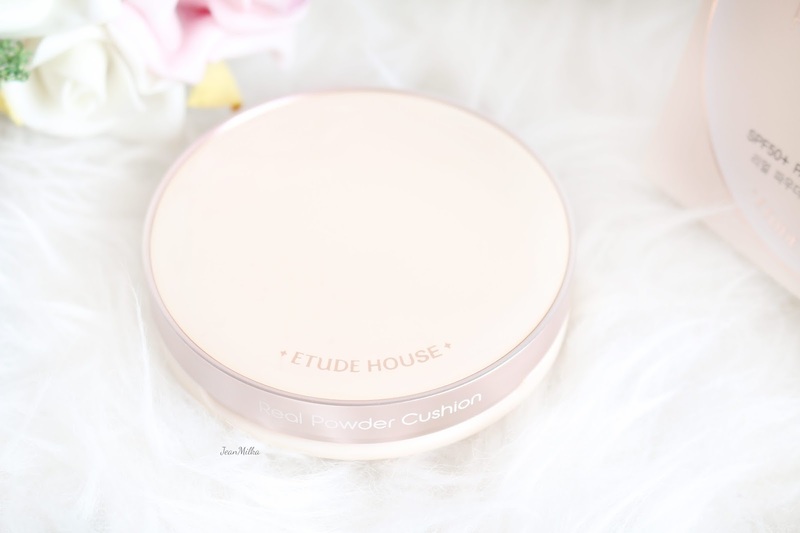 For this reason, this particular cushion caught my attention; Etude House’s Real Powder Cushion, liquid in cushion that sets to powder finish. The packaging is slightly thinner than that of a normal cushion’s. 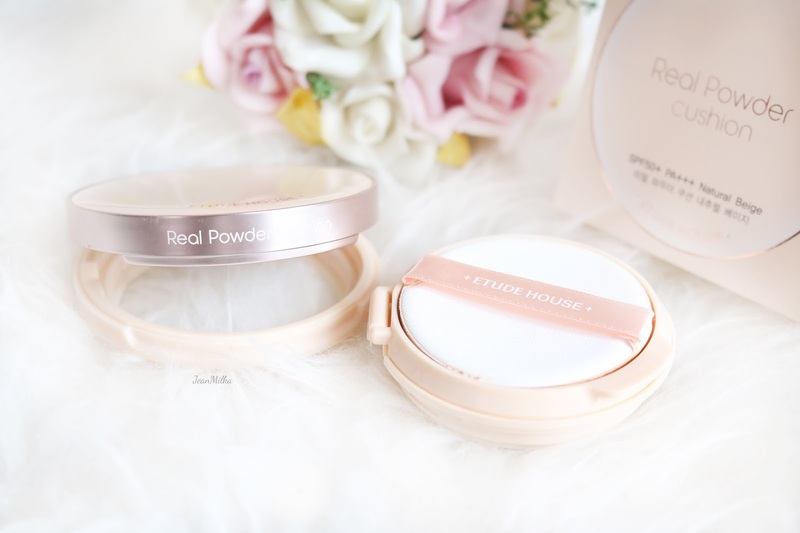 It boasts an elegant peach-beige colored compact front with rose gold details around it. I like that it's very sleek and thin, making it a perfect compact to carry around with you. Just like the other cushion, you can discard its empty contents and exchange it with refills. However it is not interchangeable with other cushion case. The product itself is consistently thick and takes some work to blend out. It's better to apply the product section by section on your face. It tends to dry quite fast. The coverage is medium to full and you can build it up to cover areas you’re concerned about. 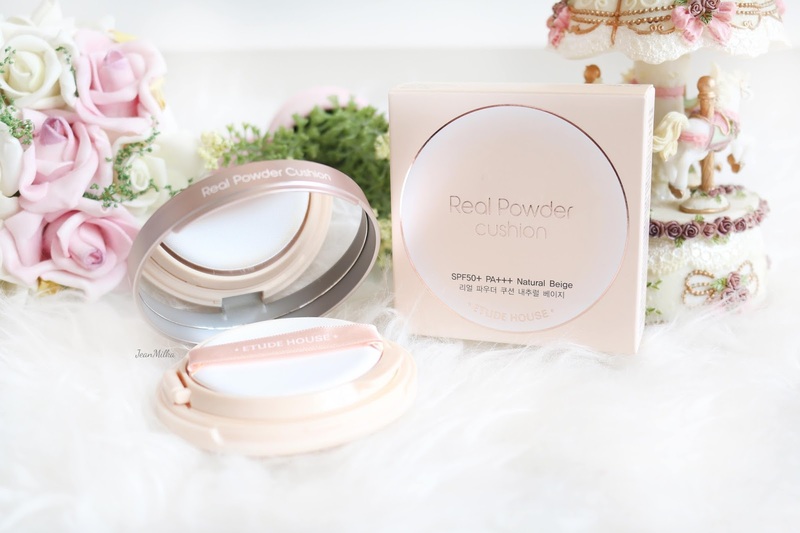 Etude House Real Powder Cushion is designed for girls who lives in humid areas like most countries in Asia. It looks better on oily skin and if you have dry skin you’re gonna need to add a lot of moisturizer under it. By the way, this product is available in 3 colors : Light Beige, Natural Beige and Honey Beige. I tend to prefer Natural beige as my primary color. It’s the perfect match for my skin tone. My skin tone is somewhere around NC 25 on Mac’s skin tone chart. I have oily skin but you can still see from the left picture below, this product doesn’t blend very well with my own skin. It is really noticeable that I wear makeup. I believe we want a foundation that makes our skin look flawless in the most natural way possible. It looks better after it blends with the excess oil that my skin tends to produce. It sets to powder finish but still leaves a little bit of sticky feeling. I prefer to add loose powder on top of it, just like I usually did every time I wear foundation. At first I really liked the result. I took the below photo 3 months after using the product. On my first month with this cushion, it wasn't as dry and cakey as it is now. It's quite disappointing that the product only gets drier after three months. 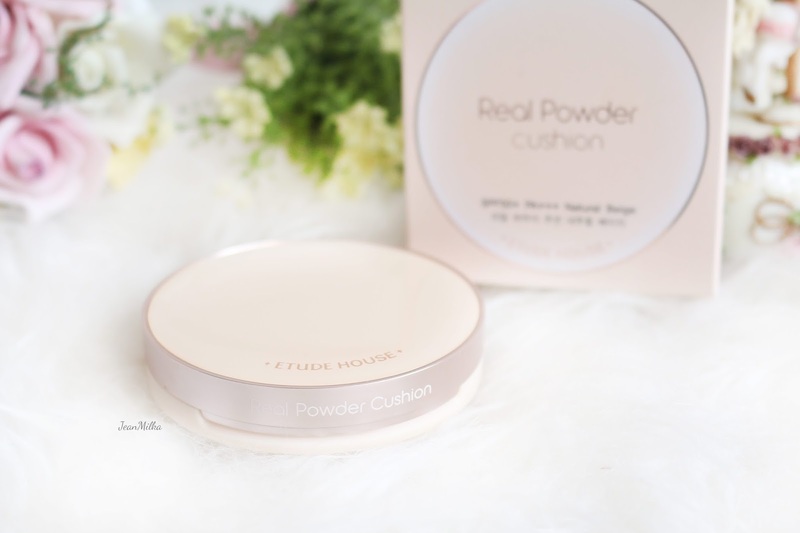 It feels heavy on the skin and not as plumping as other cushion. 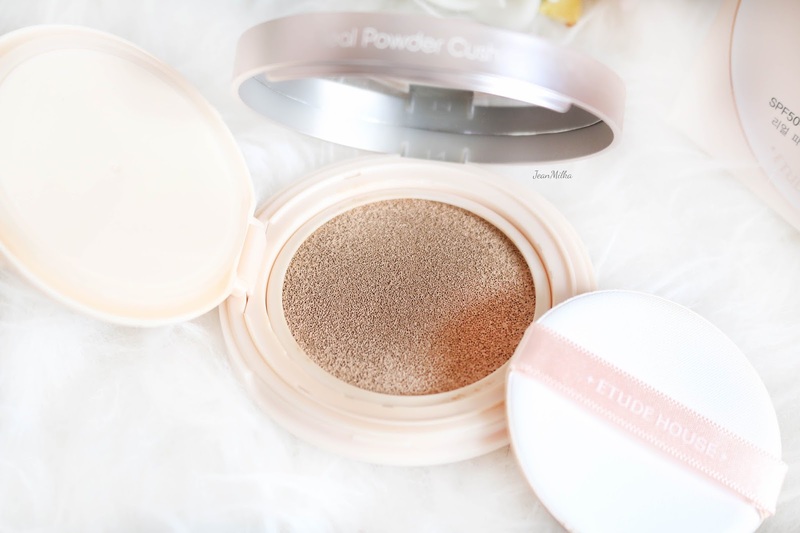 If you are looking for a natural, dewy cushion, this is not the product for you. I can still see me wearing it when I’m in a hurry to attend a party or formal event, but I won’t be wearing it as my daily makeup routine. I might will repurchase it again. I really like the coverage and it's save me so much time since I need to apply additional concealer. I want to give it another try since I remember how great it is first time I wore it. Maybe I got a bad batch that dry so fast or maybe I was not closed the lid properly. So far this is the only full coverage cushion I found and it's definitely a saver when I was in hurry. 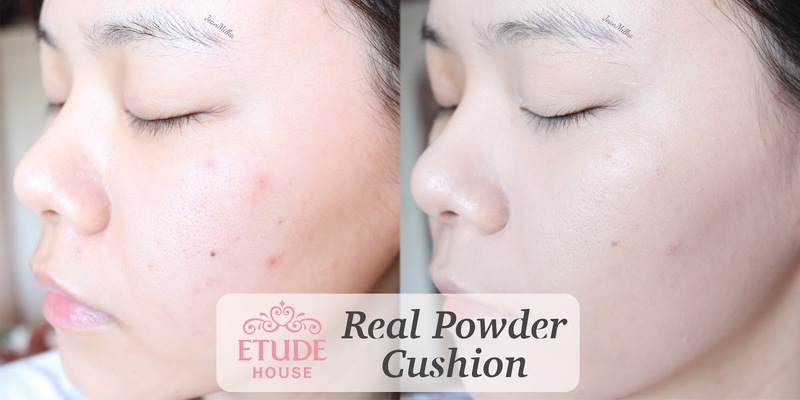 6 komentar on "Etude House Real Powder Cushion Review"
seemingly perfect for my skin too because I love matte result. Cobain cobain cobain hahahah... yang ini ok kok. Aku juga suka banget. Cuman kayaknya punya ku kurang baik nutupnya jadi agak cepat kering. Tapi kalo yg buat di pake tiap hari ini ok banget sih. Kalo aku sempat aku tinggal lama soalnya. Aku pribadi lebih suka face shop oil contral. Ini tuh bagus tapi buat makeup full banget. terasa agak berat dan cepat kering gitu. Nah kalo face shop lebih buat everyday, nggak kerasa berat, nggak cover banget tapi cukup lah.